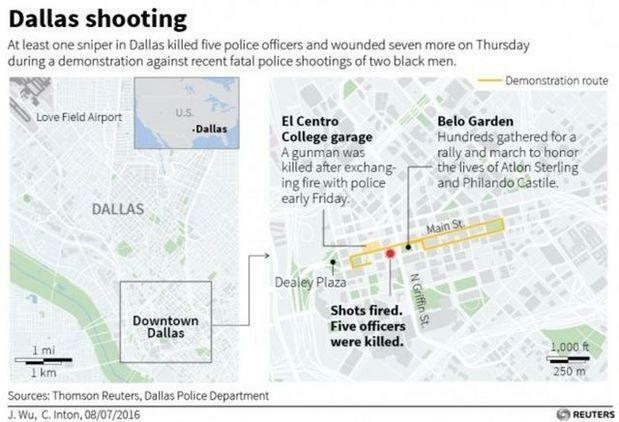 (Reuters) — At least one sniper in Dallas killed five police officers and wounded seven more in a coordinated attack that ended when police used a bomb to kill a shooter who told them he wanted to kill white officers, authorities said Friday. Police described Thursday night’s ambush as carefully planned and executed and said they had taken three people into custody before killing the fourth after a long standoff in a downtown garage. “We had an exchange of gunfire with the suspect. We saw no other option but to use our bomb robot,” Dallas Police Chief David Brown told reporters at City Hall. In talking with police negotiators, the suspect said he was not affiliated with any group, according to Brown. Quinyetta McMillon, who had a child with Alton Sterling, the black man slain by police in Baton Rouge, Louisiana, earlier this week, condemned the Dallas attack in a statement. Some of the largest police forces in the United States were on high alert on Friday, following the attacks in Dallas, with departments in New York and Boston ordering officers to patrol in pairs. The shots rang out as a protest in Dallas was winding down, sending marchers screaming and running in panic through the city’s streets. Rawlings told CBS News the people in custody, including one woman, were “not being cooperative” with police investigators. He said the assailant who was dead was being fingerprinted and his identity checked with federal authorities. “(They were) working together with rifles, triangulating at elevated positions in different points in the downtown area where the march ended up going,” Brown told a news conference. President Barack Obama, who was traveling in Poland, expressed his “deepest condolences” to Rawlings on behalf of the American people. “I believe I speak for every single American when I say that we are horrified over these events and we are united with the people and police department in Dallas,” he said. “We still don’t know all of the facts. What we do know is that there has been a vicious, calculated and despicable attack on law enforcement,” he said. The Dallas-Fort Worth metropolitan area is one of the nation’s most populous and is home to more than 7 million people. The day earlier, police in Baton Rouge shot dead Sterling, 37, while responding to a call alleging he had threatened someone with a gun. Dallas is a pioneer in training its police officers in de-escalation techniques, Rawlings told reporters, saying the department had the lowest number of police-involved shootings of any large American city. The suspect in the Dallas standoff had told police “the end is coming” and that more police were going to be hurt and killed. Presidential candidates Republican Donald Trump and Democrat Hillary Clinton canceled planned events following the attack.